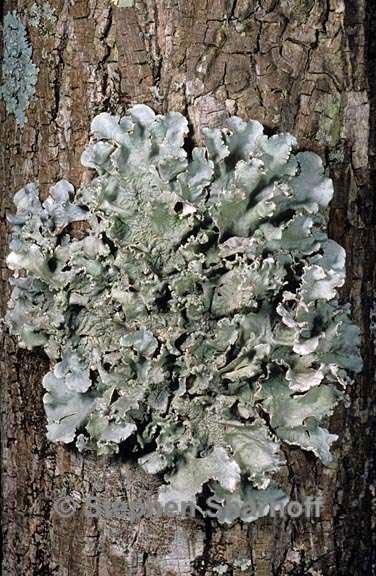 Thallus: foliose, adnate to loosely adnate, 3-15 cm in diam., lobate lobes: subirregular, elongate, slightly imbricate, plane, separate, 8-15 mm wide; apices: rotund, ciliate; cilia: sparse, 0.3-2.0 mm long upper surface: gray with some blackened areas, smooth, dull to shiny, sometimes white pruinose, usually white maculate soredia: granular, common, in linear, marginal to submarginal, soralia; isidia and pustulae: absent medulla: white with continuous algal layer lower surface: black with brown to mottled white naked zone peripherally, centrally rhizinate; rhizines: scattered, simple Apothecia: very rare, substipitate, up to 5 mm in diam. ; margin: sparsely sorediate; disc: brown, imperforate ascospores: ellipsoid, 22-30 x 13-16 µm Pycnidia: not seen Spot tests: upper cortex K+ yellow, C-, KC-, P-; medulla K+ yellow turning orange, C-, KC-, P+ orange Secondary metabolites: upper cortex with atranorin and chloroatranorin; medulla with norstictic acid (major) and connorstictic acid (minor). Substrate and ecology: usually on trees in open habitats, rarely on rocks World distribution: eastern USA and NW Mexico Sonoran distribution: southern, coastal regions of California and Baja California, Baja California Sur, Sonora and Sinaloa. Notes: Culberson (1973) proposed a new taxonomy based on the assumption that chemical evolution had occurred prior to morphological differentiation. The result is that P. hypoleucinum, P. hypotropum and P. louisianae are all morphological nearly identical. The species have not yet been investigated from a molecular perspective.